Students will be able to solve addition facts up to 20. Tell students that this month is very special because on March 17 people all over the world will be celebrating St. Patrick's Day. Explain to students that one of the symbols of St. Patrick's Day is a four leaf clover, which is considered very good luck and offers magical protection to whomever finds it. Therefore, people go hunting in search of four leaf clovers. Tell students that today we are going to play a version of Go Fish! but it will be called Go Hunting! and the cards will have four leaf clovers on them as a way to celebrate St. Patrick's Day. Project the St. Patrick's Day Addition #2 worksheet onto the board. Tell students that this worksheet contains addition math facts and their job is to find the sum for each math fact. Remind students that the sum is the total amount resulting from the addition of two or more numbers. Call on a student to solve the first math fact (6+6= ____) and to share their strategy for finding the sum. For example, memorization of math facts, drawing a picture, or using math manipulatives. Continue solving the addition math facts in the first row by calling on student volunteers to find the sum and share their strategy. 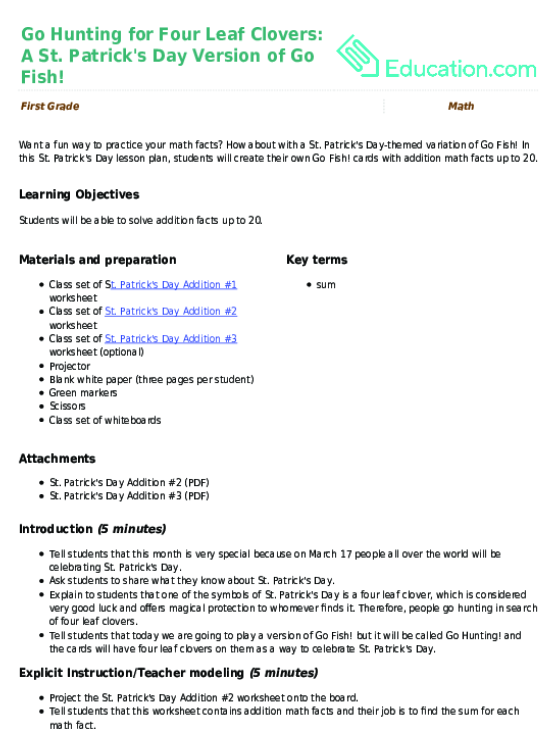 Distribute the St. Patrick's Day Addition #1 worksheet and St. Patrick's Day Addition #2 worksheet to each student and provide students with time to complete these with a partner or in a small group. Circulate around the room providing extra support, scratch paper, or manipulatives if necessary. Come together as a group to share sums and address any questions or challenges. Tell students that they have completed the first step in today's lesson by finding the sums to all of the addition math facts. Explain to students that the second step is to create their own Go Hunting! cards. * Instruct students to make two cards for each addition math fact (a total of 48 cards). One card will have the equation (5+5) and the second card will have the sum (10). Students will play in groups of two. Tell students to decide which student will go first by playing a quick game of Rock Paper Scissors. Deal seven cards to each student and spread the remaining cards out in the middle. The first student will ask, "Do you have a card that equals ____?" Their partner will respond by saying, "Yes. I have ____+ ____" or "No. I don't have a card that equals ____ . Go Hunting!" The player will then select one card from the middle. If a player gets the cards they asked for, either from their partner or from the middle, then they place the two cards down in front of them and get another turn. If they don't, then their partner gets a turn. The game is over when one player gets rid of all their cards or if all of the cards in the middle are gone. Then, the winner is the player with the most matching pairs of cards laid down in front of them. Distribute three pages of blank white paper to each student and model for students how to fold their paper so that it creates eight rectangles when unfolded. Tell students that in their pairs, one of them will be making the cards using the equations and sums from the St. Patrick's Day Addition #1 worksheet, and one of them will be making the cards using the equations and sums from St. Patrick's Day Addition #2 worksheet. Instruct students to cut out each rectangle and write the equation on one card and the matching sum on the other card. Encourage students to draw a four leaf clover on the back of their cards. Tell students once they are done to shuffle their cards with their partner's cards and start playing Go Hunting! Provide more examples of how to solve the addition math facts during the Explicit Instruction/Teacher Modeling section of this St. Patrick's Day lesson plan. Provide students with manipulatives (e.g. unifix cubes or counters) to assist them with the addition math facts during Guided Practice/Modeling. Give students the option to focus on the St. Patrick's Day Addition #1 worksheet instead of completing both worksheets. Group together students needing extra support to play Go Hunting! so that all of their cards are using less challenging addition math facts. In this St. Patrick's Day lesson plan, provide students with more challenging addition math facts. Group together students needing an extra challenge to play Go Hunting!, so that all of their cards are using more challenging addition math facts (reference St. Patrick's Day Addition #3 worksheet). Write an addition math fact on the board and tell your students to solve the equation on their whiteboards. Tell students to hold up their whiteboards after solving the equation so that you can check their work. Continue with at least five addition math facts up to 20. Want a fun way to practice your math facts? How about with a St. Patrick's Day-themed variation of Go Fish! In this St. Patrick's Day lesson plan, students will create their own Go Fish! 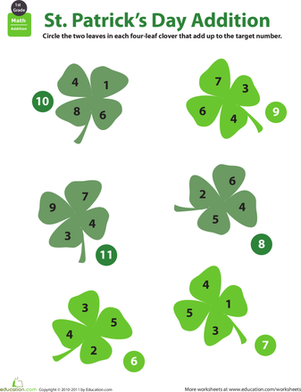 Can your first grader dig through a leafy mess to find the numbers that are added together for each clover? He'll come out of it with stronger addition skills! 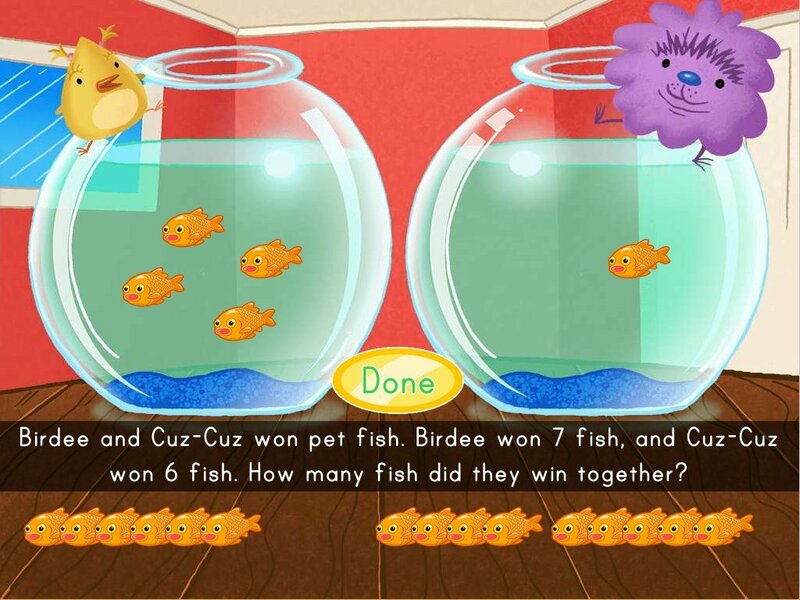 Fish for answers with this great math worksheet! Help your child practice his simple addition and counting. Fishing fanatics, here's a great math worksheet for you! Help your child practice his simple addition and counting. Let's go fishing! Here's a great worksheet to help your child practice his simple addition and counting. Time to go shopping! With this money math worksheet, your kid will do some simple addition while learning the concept of money.